Mal de Debarquement Syndrome (MdDS) is a rare condition in which those afflicted perceive a continuous rocking or swaying sensation, often relieved when in motion and symptomatic when attempting to remain still. The degree of severity varies from person to person with typical onset of symptoms occurring following travel, commonly after disembarking a cruise, hence the name of the syndrome. There is variability in the literature defining MdDS but in general when symptoms are transient (2 days or less) it is referred to as “land sickness” while persistent symptoms (>3 days) is referred to as MdDS. (1) MdDS is thought to be an abnormal weighting of the systems responsible for balance. We have 3 pathways controlling balance: vision, vestibular (inner ear) and somatosensory (sensory information taken in through our skin, muscles, bones, joints, etc). Under normal circumstances, while on firm, stable surfaces, we are using 70% somatosensory, 20% vestibular and 10% vision. While on unstable surfaces (such as walking around on a boat), we are using 60% vestibular, 30% visual cues and 10% somatosensory. (2) It is hypothesized that the re-weighting of the sensory paradigm does not “reset” in MdDS patients. There is no known cure as the exact cause has yet to be determined. 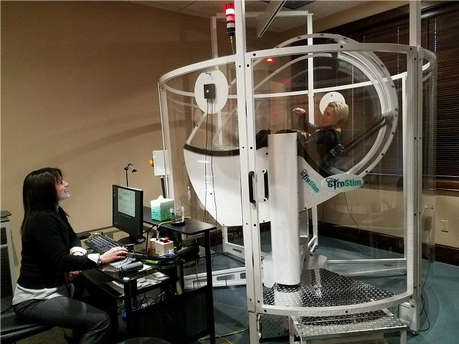 We recently trialed treatment using an automated, multi-axis rotational chair (AMARC) with visual targeting system (VTS) in a single patient with MdDS. The system used in this case is GyroStim, a computerized, multi-axis rotational chair, moving in either or both the pitch and yaw planes with variable speeds between 1 to 30 revolutions per minute (RPM). Four electronic targets are placed around the perimeter of the chair that respond to a laser pointer and are tracked by the computer for accuracy and number of hits. The individual in the chair is using either 1 or 2 laser pointers, held in 1 or both hands, respectfully, or a laser pointer attached to a head mounted strap. There is currently a lack of empirical data in the literature regarding use of an AMARC with VTS, however, profound improvements have been reported by individuals anecdotally. After seeing a variety of providers, Cindy, a 60 year old female, was officially diagnosed with MdDS by a Neuro-Otologist in 2013. Her initial onset of symptoms began in 2006 after disembarking from a cruise. Prior to AMARC with VTS treatment, Cindy experienced a strong internal feeling of continuous movement as well as outwardly observed rocking and swaying, primarily in a side to side motion. She had been unable to work for the last 4 years, ride a bike (unable to start and stop independently), sit still, sleep soundly, perform routine activity such as grocery shopping or eating out in a busy restaurant, and had difficulty thinking clearly. Prior to treatment, she was unable to maintain her balance on compliant (unstable) surfaces with her eyes opened or closed. Her balance tests on compliant and firm surfaces were significantly impaired compared to age and gender matched peers. Her walking speed was slow and guarded, holding onto her spouse for stability or reaching for nearby surfaces while also using a cane. Cindy’s sway in sitting was so pronounced (swaying side to side about 60 times per minute) that it actually made the evaluating therapist a little nauseated by the end of the evaluation. Cindy’s Dizziness Handicap Inventory (DHI) was 82/100 at her initial evaluation, indicating a severe perception of handicap (the higher the number the worse the perceived handicap with 70-100 noted to be severe). Cindy had tried traditional vestibular rehabilitation intermittently over the years without success. She did work with psychology in the past to address her depression and suicidal thoughts following her onset of MdDS which she indicated helped her cope better with her symptoms, however, it did not change her sensation of constant motion. When treatment was implemented using the AMARC with VTS, we began with low levels of movement in either or both the pitch and yaw planes, working to perceive, process, and react to targets which were strategically placed around the perimeter while Cindy “hit” the targets with a laser pointer. Her score and symptoms were monitored to ensure the correct level of stimulation and challenge. Since Cindy naturally felt better in motion and would not have been limited by symptoms to move faster, we were cautious to avoid faster motion if she was not able to satisfactorily perceive or connect with the targets. The goal was to ensure that vision, vestibular and somatosensory cues matched. Additional cognitive and visual challenges were systematically added when they were appropriate. Cindy was seen for 10 sessions, 2 sessions per day (once in the morning and once in the afternoon) over 5 days. The repetitive sessions in a condensed time was to promote habituation training through repeated stimulation while she stayed in the local area for 1 week, eliminating her extended car rides since she did not reside in close proximity to our clinic. Cindy made continual progress throughout her 5 days. The morning of day 3 was the first time Cindy noticed that she was symptom-free since being diagnosed with MdDS. While a full resolution of symptoms did not persist, her sensation of movement reduced from a 10/10 prior to starting treatment to no greater than 2/10 by the end of treatment. During day 3 of treatment Cindy’s sway changed from lateral (side to side) to anterior-posterior (front to back). Modifications in movement were made which promptly resolved symptoms. Several days into treatment, Cindy reporting lying in bed to go to sleep without symptoms for the first time in years. By the end of her treatment using the AMARC with VTS, Cindy’s walking speed doubled, proud to now be walking faster than her spouse and without external support, her visible sway resolved and she reported 90% improvements. The only remaining residual symptom noted was a subtle vertical bobbing sensation reported as no greater than 2/10 intensity which was not constant. Following her week of treatment, Cindy’s DHI score was 2/100 (0-39 is a low perception of handicap), reduced from 82/100. She could maintain balance on compliant surfaces with her eyes opened or closed and her balance testing on complaint and firm surfaces were normal as compared to age and gender matched peers. She additionally reported resolution of brain fog with the ability to think more clearly and now able to multi-task. It has been just over 6 weeks since the completion of treatment and Cindy continues to report sustained improvements. She is now able to ride a 2-wheeled bike, starting and stopping independently, has been driving locally without exacerbation of symptoms, is walking regularly with plans to join a walking group, is now able to go grocery shopping on her own and go out to eat without hesitation. She has times when she is symptom-free and other times in which she reports a low sensation of symptoms. She plans to return for 1 additional week of AMARC with VTS treatment to see if complete and permanent resolution of symptoms is attainable. 1. Van Ombergen A, Van Rompaey V, Maes LK, Van de Heyning PH, Wuyts FL. Mal de debarquement syndrome: a systematic review. 2015. J Neurol. 2016 May;263(5):843-854. 2. Peterka RJ, Loughlin PJ. Dynamic regulation of sensorimotor integration of human postural control. J Neurophysiol. 2004 Jan;91(1):410-23.